Road traffic noise is mainly produced by the driving noise of the vehicle (engine) and the noise of the tires on the street. With increasing speed the noise of the tires becomes dominant. The pass-by level of the vehicle is then primarily produced by the tires and the road. How loud a vehicle is, depends on several factors. These include primarily the roadbed type, road surface, longitudinal slope of the road, tire size / twin tires and speed of the vehicle. The actual noise exposure can be carried out by calculation or by real measurement results. 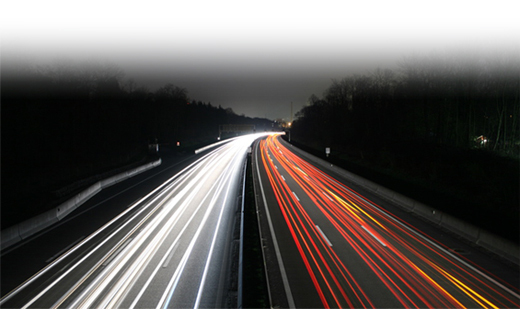 In Austria, the RVS 4:02:11 is used to calculate the noise exposure of motorways and expressways. Our services on the road sector include both, the determination of the noise pollution by measurement and calculation, the development of solutions as well as the calculation of noise protection measures, taking into account the economic and environmental requirements. Currently still the classic, conventional noise barrier (in combination with sound-proof windows) is the most widely used method to protect residents against excessive noise in compliance with national and international immission limits. The acoustic evaluation of noise barriers is carried out in accordance with ÖNORM 1793-5, the so called ADRIENNE process. With help of this method, already installed noise barriers can be checked by measurement with respect to their sound absorption/reflection behavior. Another active measure to reduce road traffic noise are low noise road surface types. In past projects we assessed acoustically optimized road surface types and determined their noise emission values, which were incorporated into the revised version of RVS 4.02.11. The pass-by noise, rolling noise, pollution and absorbance were measured during those projects and revealed even more noise reduction potentials. Noise reduction potential is also given by the use of low-noise tires. Limit values for the noise emission of tires for motor vehicles and trailers are already, as well as the measurement procedure, regulated by the EU Regulation 661/2009. The tires are divided (a≤185mm to e≥275mm) in categories C1 (PKW), C2 and C3 (commercial vehicles, speed category, load index) and tire width and must comply with the limit values since November 2012. Road joints have the task of compensating occurring stretching movements of steel and concrete bridges. However, the acoustic assessment and optimization of such systems is becoming increasingly important. In the course of a research project, our employees developed a method for acoustic assessment of expansion joints in the installed state, which is anchored ultimately in the RVS 15:04:52 "Acoustical evaluation of expansion joints".